2014 Film above by Théo Reynal and Easy Ride Videos | 60 out of 78 teams are confirmed for St Barth 2015 Edition. After years of promoting this event thanks to Pierrick Contin's images since the 2009, and after the same time frame drilling local guys head to go to St Barth, I finally managed to convince them this year, 3 Arg crews were registered, although on the draw 1 was left out. But I think it was fair to let them go as even the organizers are promoting that 'Argentines' will attend the Regatta for the first time. Due to growing success of this great event, that we helped to build & promote, also other sailors were left out (60 entries out of 78 registered) like Mischa and other NED crews, but they've already attended the event in the past. Now St Barth is accepting 60 crews! A great number considering they had 35 in 2009. Another quickly booked up edition! While the sailing season reaches its height, organizers of the St-Barth Cata Cup have completed the registration process for the next edition of the event, held from November 18 to 22, 2015. Sure sign that the F18 class is in good shape, 78 teams have pre-registered, of which 60 will navigate in St-Jean Bay, as determined by the draw. In total, 10 teams from France, 15 teams from Europe outside of France, 20 boats from West Indies, Americas and other parts of the world and 15 teams to be selected by the organisation. will come and compete against the 15 other countries that have sailed in the past editions of the event. « It is a pleasant surprise for the organisation and proof that we have been somewhat successful at putting together an event that appeals to sailors. Clearly, the word is getting out!», said Vincent Jordil, organizer of the event. In addition to the English and Argentinian sailors, one team from Australia will be back for this 8th edition. 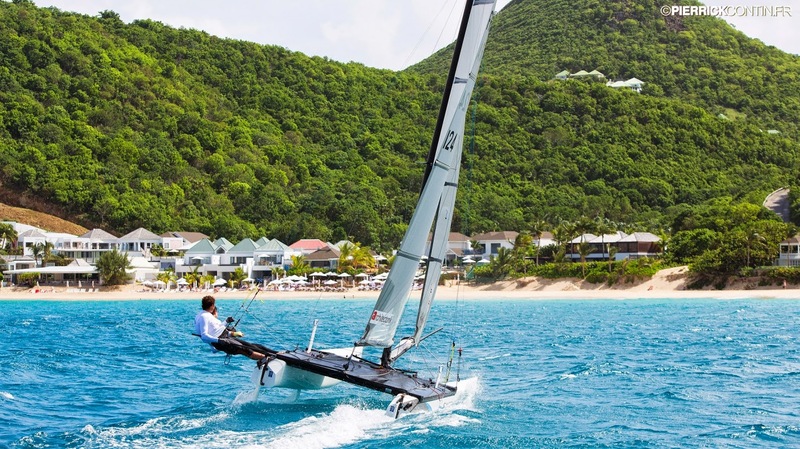 With one third of professional sailors and two thirds amateurs, the St Barth Cata Cup brings together the global elite of Formula 18 sailing and other classes like GC32, AC45 and Nacra17. Attracting sailors from the four corners of the world, 60 teams compete in 7 rounds of races in optimal conditions and an idyllic setting. The last edition was won by Morgan Lagravière, skipper for Safran and Arnaud Jarlegan, crew member for Groupama. For this edition of the event, organizers are promising the usual festive atmosphere and as ever challenging races.